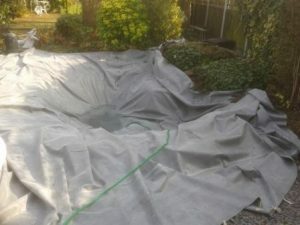 Welcome to the Essex Aquatics pond repairs page. 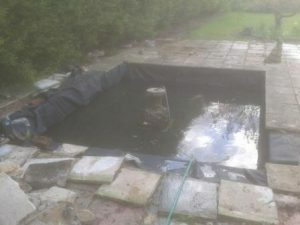 Here at Essex Aquatics we specialise and are vastly experienced in professional pond repairs and stopping leaking ponds! We are situated in Chelmsford, Essex but cover the whole of Essex, London and other surrounding areas. 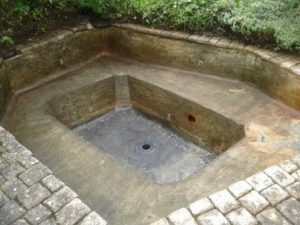 We repair all ponds regardless of size, waterproofing material (concrete, liner, fibreglass), condition. Please ring Elliot on 07732197496 or email info@essex-aquatics.co.uk to talk to us about your project. Unfortunately ponds can leak this can be down to a variety of reasons, leaking pipes, liners with holes, concrete cracking, fibreglass splitting, poor workmanship, seams wearing away just to name a few. After a quick survey we can normally name the problem and quote for remedial work. We advise why the problem could have occured in the first place and can install measures to stop it happening again. We usually guarantee all our repair work and if not fixed we will come and rectify the problem as soon as we can. 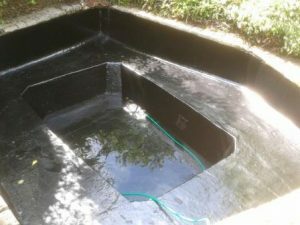 We are experienced in using rubber pond liners, pond paints, clay, clay liners, fibreglassing. We are also experienced hard landscapers so can lift up and relay any paving, coping stones or brick work leaving for a stress free solution. Contact us today about fixing pond leaks and getting your pond professionally repaired by Essex Aquatics. Call Elliot on 07732197496 or email info@essex-aquatics.co.uk, we are happy to arrange a free visit for a no obligation quote.